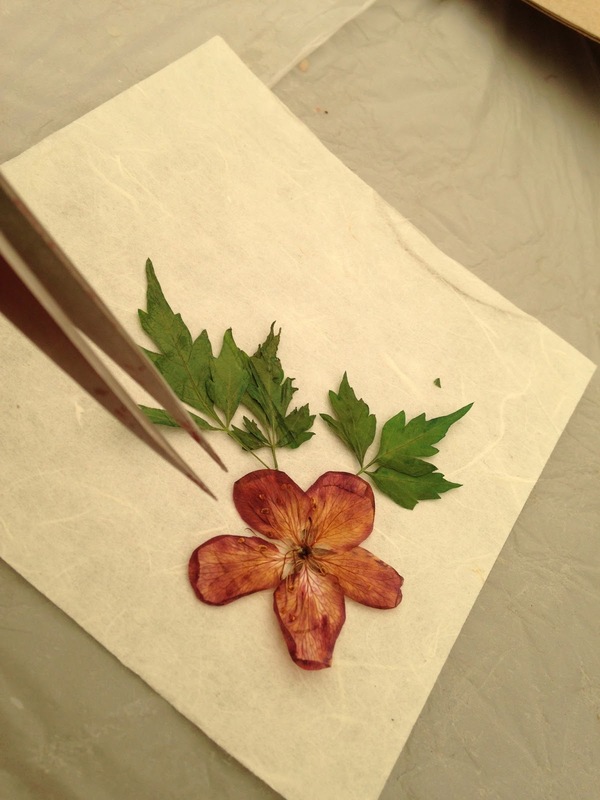 I was very excited, as always, to go to the Hanji Festival this year. I've been there three or four times since I arrived in Korea. Along with three of my great girlfriends, I took the 9am bus to Jeonju, in order to enjoy a full day of creation, inspiration and... paper! I had read on several websites that the Festival this year -- on top of having changed its name from "Hanji Paper Festival" to "Hanji Culture Festival" -- had also changed its location. The festival was no longer held in the gorgeous Hanok Village, but rather next to the Hanji Industry Support Center, a very nice center (dedicated exclusively to my beloved paper) built a few years ago. When we arrived at the Jeonju bus terminal, we hopped in a cab. I was unable to get the taxi driver to understand me (even if I was reading, syllable per syllable, the name of the place we were aiming for) so we ended up in the Hanok Village. 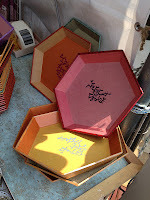 A quick visit to my Hanji teacher's workshop and we were back on the right track! We took a nice 10-block stroll on a nice sunny Saturday morning, until we reached the Festival. We walked around the different sections of the festival : the information kiosk, outdoor stage, vendor booths, cultural booths (including a booth on Korean taekwondo, Hanji traditional clothing and the Chinese paper cutting art from the city of Soju), etc. There was also a bus stop to take us to Wanju-gun, the second area dedicated to the Festival. After asking to the welcome committee volunteers if a visit to Wanju-gun would be worth the while, we decided not to bother. 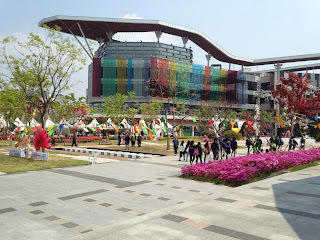 Evidently we had to take a 30-minute bus ride to get to this second site, where the activities, attractions and booths were basically the same as the ones displayed in Jeonju. The volunteers who welcomed us at the entrance of the Festival were very kind, well informed and they spoke good English. They handed us the English version of the festival brochure, along with a map of the city. If the organization bothered to produce and print an English copy of their documents, why then isn't there an English version of the Festival website? A .pdf version of their English brochure available online would already be a nice start... Korea being one of the most wired and technologically inclined countries in the world, it still amazes me to see how skimpy the websites of major events can be, when they are not totally nonexistent for non-Korean speakers. Paper snail carrying a city on its back. 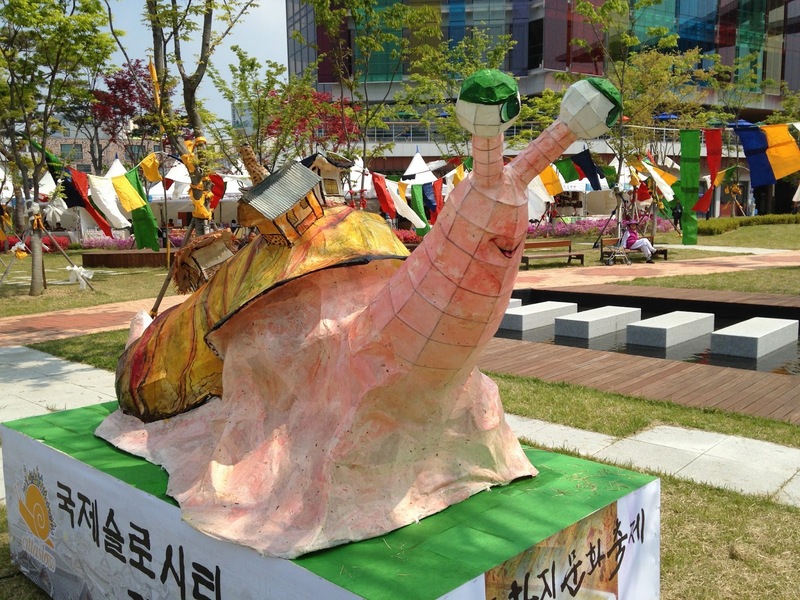 Cool symbol of Jeonju "slow city"! Now, back to the Festival! The new site was very nice; gorgeous paper lanterns were hung everywhere, as well as Hanji paper banners and flags. 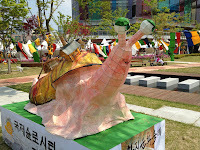 At the entrance of the Festival were hung dozens of beautiful white Hanji lanterns, and the Hanji paper snail, symbol of Jeonju "slow city," was there to welcome us as well. This new location, between the Hanji Industry Support Center and the Jeonju Cultural Center, is an excellent choice. 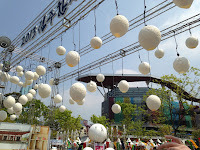 The site is vast and comfortable, less crowded than the Hanok Village and completely car-free, which is great. Unfortunately, it doesn't have the traditional vibe that offers the Hanok Village (with its beautiful houses, tea shops, tiny museums, fountains and sculptures) and it pulls the Festival away from the shop owners, artisans and artists that live and do business in the Hanok Village. We visited the few booths that were displaying the work of Hanji creators, and chatted briefly with a few of them. I was surprised to see that there were very few products for sale (mainly plates, tissues cases, coasters, hair pins and a few lamps) and that there was actually only one Hanji paper vendor! The booths were pretty quiet, and the Hanji artists weren't very voluble about their creations. Where is the enthusiasm? the passion? the excitement?.... Is it because we were four foreign gals, who made them feel uneasy? One of the reasons why I was so thrilled to go to the Festival this year was to meet "the Hanji people". Most of the time I do Hanji alone in my house, surrounded by mountains of paper and my three restless cats. Therefore, having the occasion to meet and discuss with other Hanji lovers was very appealing to me. Unfortunately, I have to admit that I wasn't able to make any real contact at the Festival. I was especially surprised to see the young artists at the Doctor Hanji booth waving at me like kindergartners and repeating "hello! hello!" in a high pitch voice when I tried to engage in a conversation with them about their Hanji handicrafts. What is this about? Isn't the Festival supposed to be the occasion to promote your art and skills? Isn't it a wonderful platform to network, meet new people who share your passion, spread the word about your handicraft work and possibly extend your business or creative spectrum?... It seems that the Hanji artisans had a different vision than mine... Honestly, despite the fact that Doctor Hanji had stunning Hanji lamps for sale in their booth, I had no desire to purchase anything, nor to ask questions or try to establish a contact with these fellow craftsmen. I just felt annoyed and walked away. Even if I wasn't able to get into real interactions with the Hanji creators, I was still very impressed with their craftsmanship. I was especially amazed with the work of the "Ye-Dam" team: their booth was filled with gorgeous pieces such as chests of drawers, book cases, tables, tea trays and lamps. Truly stunning work! In the end, there were about half a dozen booths that were displaying Hanji creations at the Festival, which is too few, in my opinion. Is Hanji a dying art? Where are all the creators? Is having a booth at the Festival too expensive, or not beneficial enough? Or were they all in their own shop in the Hanok Village, instead of being on site at the Festival? It is surely a fair question to ask. I have to admit that I am tempted to give it a try next year. 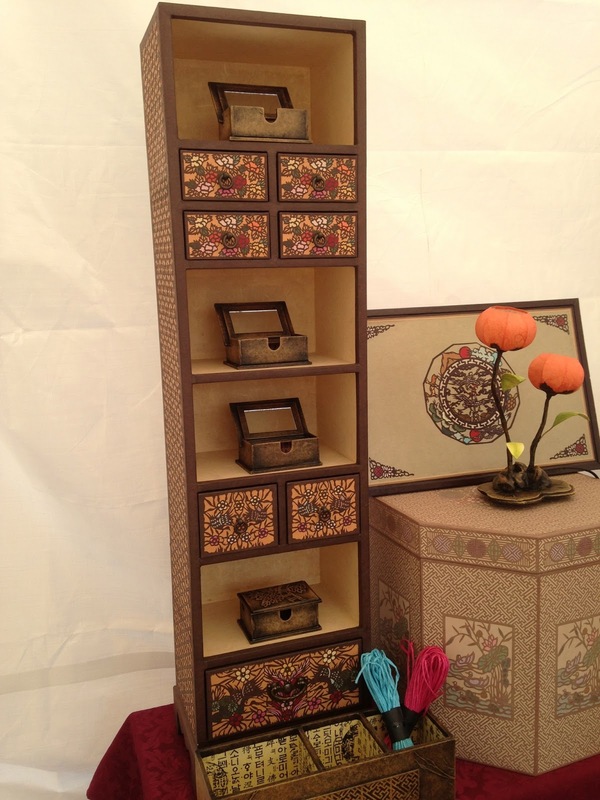 Imagine that: a Hanji Naty booth at the Festival! 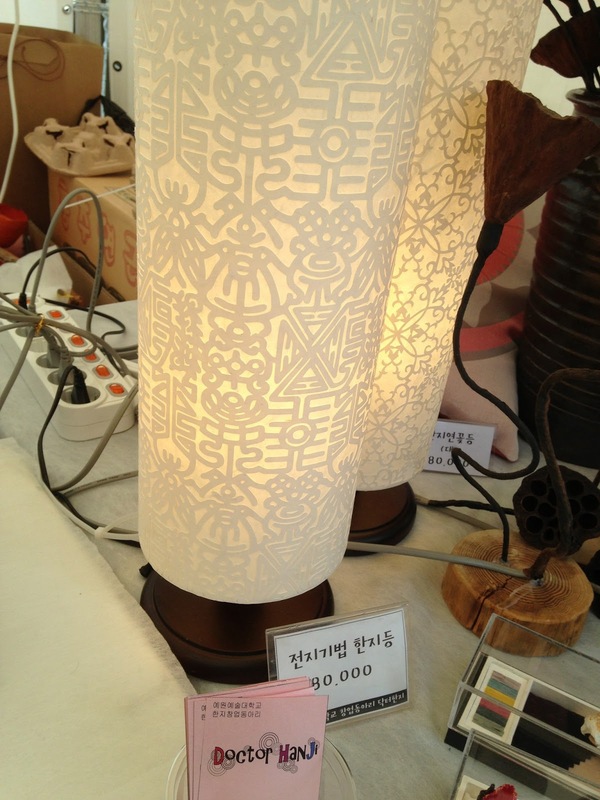 A "waygook-in" with a booth at a traditional crafts Festival in Korea.... It could create a very interesting buzz, but it could also scare people away and leave me bitterly disappointed.... What do you think? Is it worth a try? 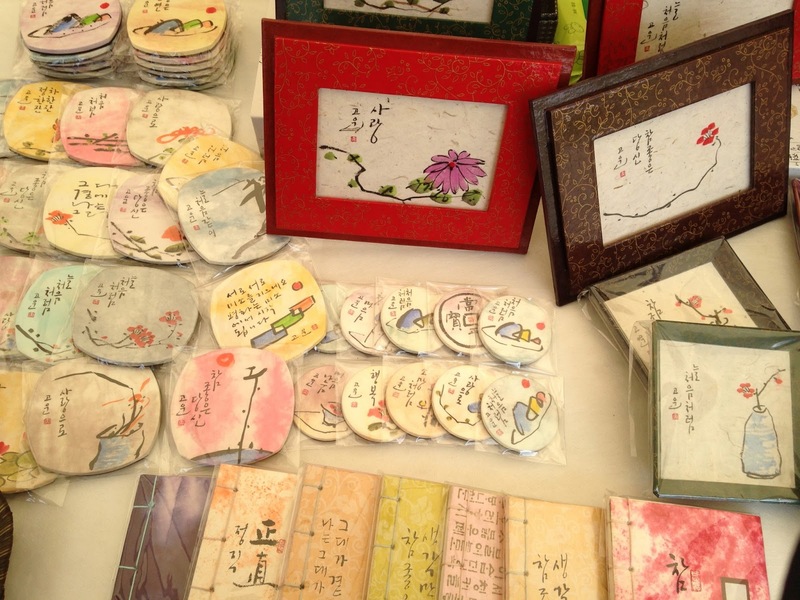 One of the most interesting aspects of the Hanji Culture Festival is the hands-on projects. This year, the visitors had the chance to create many different types of objects, such as lamps, lamp shades, pencil cases, hand mirrors, fans, piggy banks, tissue cases, dolls, etc. The hands-on section of the Festival was very well organized. 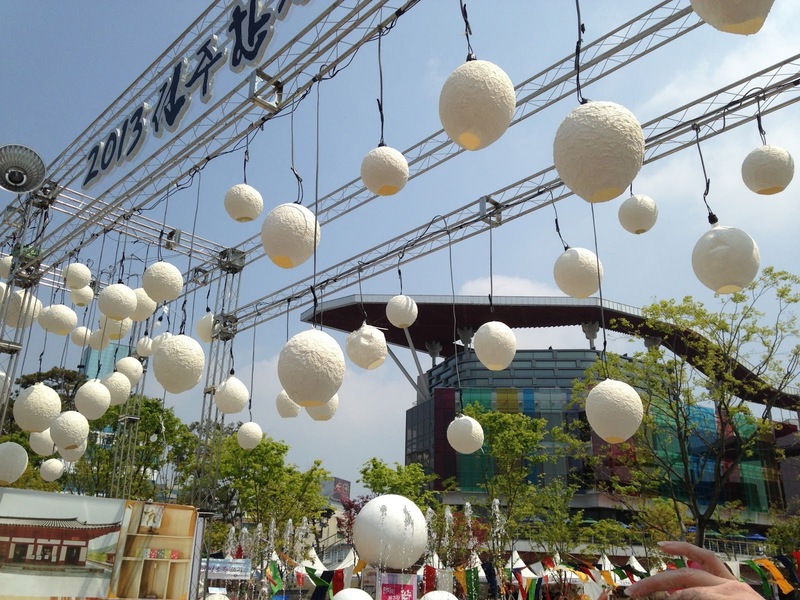 The visitors were invited to go to the ticket booth, where you could choose the object you wished to create, and pay accordingly (for example, making a square lantern cost 11,000 won). Afterwards you just go to the designated tent, and you will be guided through the process by kind and friendly Festival staff. My three girlfriends and I decided to make some square Hanji lanterns. No need to say that the presence of four Western girls at a traditional Korean crafts Festival drew a lot of attention; dozens of pictures of us doing Hanji must be circulating these days! We smiled a lot, got our hands all gooey with glue and paper fibers... we had an awesome time! Doing a hands-on project at a Festival like that is usually a very smooth process: all the pieces are already cut and prepared for you, and you are walked through the process step by step. For someone like me, who's been doing Hanji for a couple of years now, it can also be a little frustrating. I kept looking for my tools on the table, my awesome pair of Japanese tweezers, my spatula, my favorite brush. Also, there isn't much room for creativity and freedom: the pieces are already cut, the colors chosen, the designs expected. It's like giving a coloring book to a painter; it's still a lot of fun, but it feels constraining. Something especially interesting for me was the use of dried flowers and leaves; it's something I had seen done (usually on Hanji fans) but that I had never experienced. The delicate leaves and petals must be handled with much care; their colors and textures are truly wonderful. Making the whole lantern, from start to finish, took about an hour. 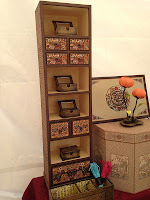 We had a very good time doing it, and we are all enjoying this new handmade addition to our home decors. Hanji has this magical way to diffuse a warm and soothing light; believe me, there's nothing like it! In a following blog post, all about the Exhibit of the Hanji Craft National Contest Winners 2013!